Sail the Rhode River, located just off Chesapeake Bay, and explore the area’s small bays, rivers and creeks. Anchor at a little island amid the Rhode River, where you can enjoy lunch, swim or dinghy to the sandy island. Dine at Pirate’s Cove, a short walk from the marina. In Chesapeake Beach you’ll find quiet secluded beaches, waterfront restaurants, succulent seafood, water park activities and events, and quaint, historic homes. Voted “Best Resort Marina on the Bay” and “Best Boatyard on the Bay” by Chesapeake Bay Magazine readers, the Herrington Harbour Marina is a must-see. Solomons Island is picturesque island town nestled in the joining of the Patuxent River and the Chesapeake. Solomons is a fishing village, alive with workboats and an active charter fishing fleet, but it’s also a place to escape. A quiet anchorage, located 7.6 miles from Algonquin, where fishermen will discover a variety of fish species. Beautiful scenery with dinghy access encompasses its white-sand beaches. 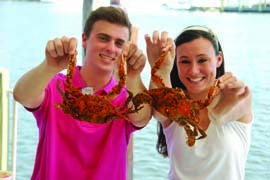 A popular spot for crabbing, many vacationers visit the destination to feast on freshly caught crabs and oysters. Oxford is located on the Eastern Shore and bordered on three sides by the Tred Avon River and Town Creek. Oxford’s allure is in its quiet, small town setting where residents make visitors feel like old friends. Oxford strives to maintain its serene, boater-friendly atmosphere and boasts a small, easily walkable downtown with enough shops, eateries and attractions to please visitors. Secluded anchorages and a rich historical heritage are among the charms of the Wye River. The western shore is well developed, but its eastern shore is quiet. On the Wye East, big old houses, many dating back to colonial days, stand on the banks. A popular spot for boats to anchor, the anchorage is secluded with large trees on hills surrounding its lush landscape. The city of Reedville is about an hour away (across the Great Wicomico) where boaters can find a couple of small marinas for food, beverages and small gifts. For more information on The Moorings’ bareboat and crewed sailboat and powerboat charters in the Chesapeake, Pacific Northwest, Caribbean, Mediterranean, Sea of Cortez, Indian Ocean and South Pacific, visit moorings.com.